The publisher is both a doctor of medicine and a lawyer. 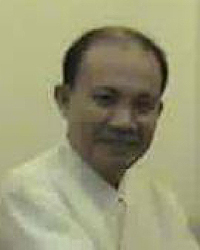 He finished his medical degree at Southwestern University-Matias H. Aznar Memorial College of Medicine (SWU-MHAMCM), Cebu City, Philippines and placed 5th in the February 1990 medical board examination. He was President of SWU Supreme Student Government from 1984-1988 and awarded as one of the Top Ten National Student Leaders for 1985 by the Philippine Asean Youth Leadership Educational Foundation (PAYLEF) and the Ministry of Education, Culture and Sports (MECS). From his preparatory medicine course to medicine proper, he was a national state scholar under the MECS program. He had his master’s degree in Hospital Administration at UP-College of Public Health, Manila, in 1994 and passed the 2000 bar examination after finishing his law degree on the same year. He is also the publisher of Health Laws And places, which was temporarily stopped on October 2012 when he suffered stroke last February 29, 2012, which paralyzed his right body. The site was revived last August 2013. While recovering from stroke, he established this site, including Online.ph, WORD@thenetpedia and twelve (12) other blogger.com sites. His interests in this site is due to his spiritual encounter while recovering from stroke, which revealed to him, among others, various morality and religious deceptions, which are not being taken seriously in the present generation. He was likewise informed of “coming in two years time” last April 2012, which coming is noted in the scripture to be coupled with punishments. The publisher believes that what happened to Philippines last October 15, 2013 (Cebu-Bohol earthquake) and November 8, 2013 (Typhoon Yolanda) are just preliminaries to what will happen starting April 2014. As to his religious background, the publisher, as a Roman Catholic, also attended occasional gatherings at the Baptist church and read the scripture when he was in high school. He also attended the “navigators” christian group gatherings when he was in college. But he returned to Roman Catholic church believing then it was the one established by Christ until realizing some significant errors prior to stroke. Due to stroke, he became serious on his belief and had started to read again the scripture, which helped him confirm on what were revealed while recovering from stroke. He finally got out of Roman Catholicism for good. Also, to his surprise, he was spiritually informed, among others, of who he is.